Wholesale massacre of sharks. When will it stop? “Some Somali shores became uninhabitable because some of the ships were throwing thousands of Shark carcasses into the sea after their valuable fins had been cut off. 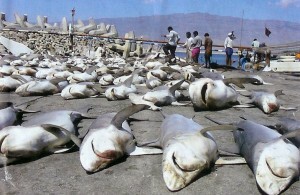 The mutilated dead bodies of these majestic sharks were coming into shore and decayed on the village beaches. The smell was terrible and many residents were getting sick due to infections carried by flies from the rotting carcasses. The residents of the coastal towns such as Garacad, Jariiban, Idaan etc. suffered severely. An entire shore line could look like red for entire days; this was not blood but floating lobster-eggs shaven from the processing of Lobster tails for the rich clients mainly in Kenya and Dubai.